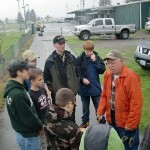 We have a Shooting Sports weekend scheduled for June 4/5, 2011. Please visit here for more information and to register. We will do Patrol Planning at our next Troop meeting. Good time to work on requirements. Next Tuesday, May 17th, Troop 2 is sponsoring a Leadership 101 talk at Gloria Dei Lutheran Church starting at 7 p.m. All Scouts are invited. Please see here for more information and to signup. I would be glad to drive scouts home, just let me know if it is needed. On our May 26th Troop meeting, we will be having members from Law Enforcement onsite to work on some Tenderfoot requirements. In the past, after the requirements part they have brought in their bomb robots and/or drug dogs for demonstrations. They have promised us “good” stuff this time, so you are sure not going to want to miss out this time!